Before using a crown the dentist will shape the tooth by removing some of the outer surface. Sometimes the dentist may have to "build up" the core of the tooth (particularly if a lot has broken off) with filling material or put a post into the tooth so that the crown has something to sit on. A dental core form fits on a portion of a tooth on which a core for a crown is to be formed. The form is folded lengthwise and made of synthetic plastic material. Stippling or roughening of the lower part on the outside of the form will assist to secure the form by adhesive in the mouth during formation of the core. 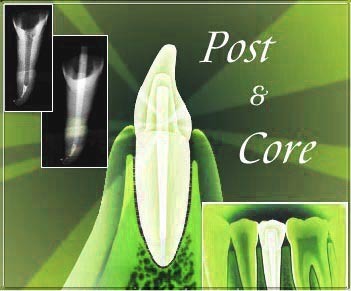 A "post" is a rod that a dentist has positioned and then cemented in the canal space in a tooth's root. Typically, but not always, dental posts are made out of metal. Posts are usually only placed in those teeth which have extensive portions of their natural tooth structure missing. A dental post provides a way for the dentist to securely anchor this filling material core to the tooth.